Removal ProcedureRaise and support the vehicle. Refer toLifting and Jacking the Vehicle.Drain the transfer case fluid. Refer toTransfer Case Fluid Replacement. 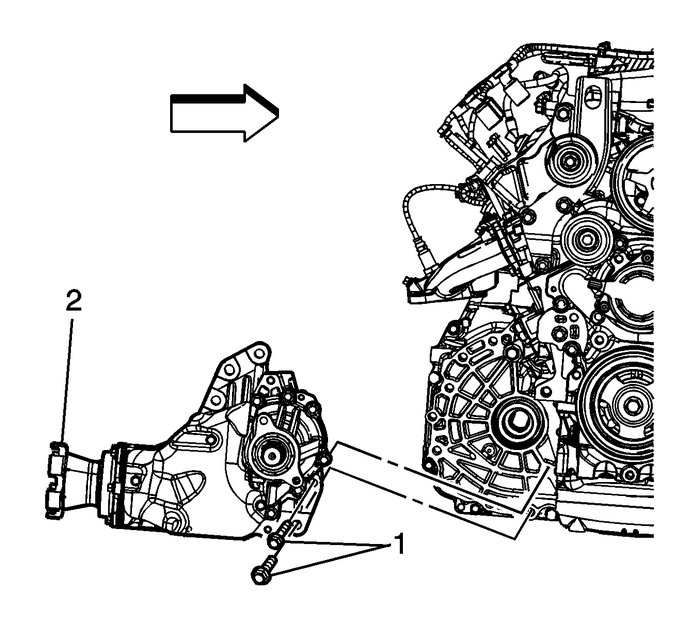 Remove the transfer case assembly (2). Refer toTransfer Case Assembly Replacement.Remove the intermediate shaft bearing seal, snap ring and intermediate drive shaftassembly from the transfer case. Refer to Intermediate Drive Shaft Removal inTransfer Case Disassemble.Remove the O-ring, half shaft retainer, intermediate shaft bearing retainer and bearingfrom the intermediate drive shaft. Refer to Intermediate Drive Shaft Disassembly inTransfer Case Disassemble.Installation ProcedureInstall the O-ring, half shaft retainer, intermediate shaft bearing retainer and bearingto the intermediate drive shaft. Refer to Intermediate Drive Shaft Assembly inTransfer Case Assemble. Note:Special tool DT-48094 must be used to install the intermediate shaft. Install the intermediate shaft assembly and snap ring into the transfer case. Referto Intermediate Drive Shaft Assembly inTransfer Case Assemble.Install the intermediate drive shaft bearing shield. Install the transfer case assembly (2). Refer toTransfer Case Assembly Replacement.Fill the transfer case with fluid. Refer toTransfer Case Fluid Replacement.Lower the vehicle.